Following the fluctuation of vegan cookbooks and celebrities endorsing meat-free meals, consumers are beginning to change their food choices, for both nutritional and ethical reasons. Those who eat meat are also increasingly choosing vegan options to add variety to their diet or to increase the amount of vegetables they are eating. It has been recorded that the number of vegans in the UK has rocketed to 3.5 million, so the hospitality industry has noticed the need to adapt. We are now starting to see menus changing and street-food stalls popping up that cater solely to vegans. George Rouse, owner and head chef of George’s Kitchen, a corporate catering company, explains how even casual restaurants can include vegan options on their menus. If supermarkets are starting to sell vegan sandwiches, then so can casual dining restaurants. Barbecue pulled jackfruit, avocado and humus and falafel sandwiches or wraps have become hugely popular with the vegan community as an alternative to other convenience bought sandwiches. Vegan burgers can consist of anything from beetroot, to tofu and mushrooms to soya beans. Covered in vegan cheese and served with a tomato salsa means that vegans don’t have to miss out on this quick food classic. Starters that include fish or meat can easily be made vegan by swapping for tofu alternatives, having minimal impact on the flavour. George’s Kitchen have found that it’s important to offer vegan friendly dishes similar to everyone else’s rather than changing the dish completely. For example Tuna loin with crispy cucumber and daikon salad topped with miso crisps can be swapped for marinated seared tofu, crispy cucumber and daikon salad with Thai sesame dressing. 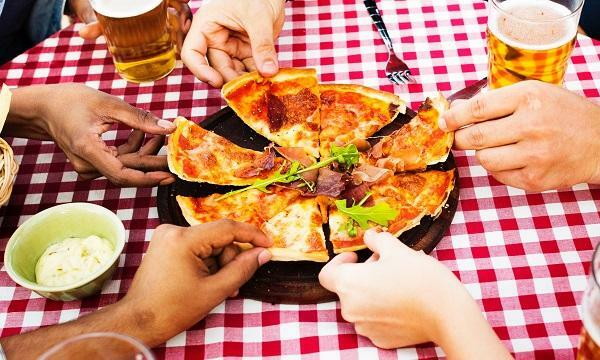 Vegan pizzas are becoming increasingly popular, making the restaurants that sell them popular too - who doesn’t like treating themselves to a pizza? Cheese can easily be exchanged for vegan cheese (or not included) and topped with anything delicious that doesn’t have meat or dairy in it – perfect for those who do like pineapple on their pizza. Quick food and street-food stalls are also becoming popular at weddings, so if you’re catering for a wedding, vegan options will do down well with all types of guests. If your QSR serves up food inspired by other countries around the world, introducing something like a vegan bean burrito or tofu or mushroom noodles will give you a new customer base who will also appreciate your brand for catering to them.